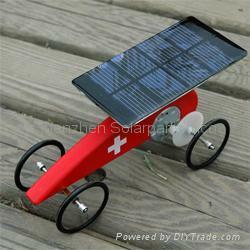 Within five minutes you can assembly the Mouvelette DIY solar car modules，During the process, you can enjoy the experience of smart and precision design from Swiss team and acquire the operation theory of the solar panel, the most economic, unlimited and green energy supply from the sun. 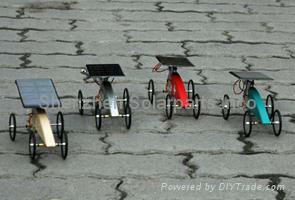 In the sunny day, when the sunshine reflect on the solar panel, the panel will generate the power to drive the engines to running. 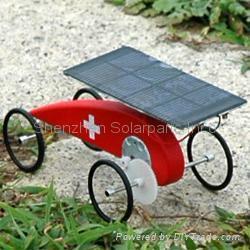 Wherever the car on the flat, hillside or rough ground, the car can running stable and reliable. Easy to Assembly and enjoy the fun! Please refer to right picture and assembly instructions for the parts and assembly information. The details as followings: 1. Start from the wheel sets, you need to take off the plastic cover which attach on the wheel transparent, and latch the black rubber tires. Then you need to insert the black reducer into the middle hole. This way you finish a wheel assembly. Follow the method you can assembly the other three wheels. 2. Then is the installation of solar panels. Mounting to find a square with a screw bolt tight body fixed in the top; then release the solar panel screws are negative, the car onto the wire, according to positive and negative through the screw holes and bolt tight screws; remove mounting on a square The gum stickers, solar panels will be fixed above the body of the vehicle mount, that is, the completion of assembly. 3. Then is the installation of solar panels. Mounting to find a square with a screw bolt tight body fixed in the top; then release the solar panel screws are negative, the car onto the wire, according to positive and negative through the screw holes and bolt tight screws; remove mounting on a square The gum stickers, solar panels will be fixed above the body of the vehicle mount, that is, the completion of assembly. Sunshine Reflect on the Solar Panel, The Car Running on the way. Sunlight through the body of the vehicle above the solar panels, rear-wheel motor-driven operation. The stronger the sun, the greater the power, the faster the car run. Only in the sun covered by clouds, the car was not running. Unless the gap between too much, otherwise the general road gravel or wood can be unimpeded. So smooth asphalt roads, as long as it is fine weather, the car can enjoy music! Solar car does not use batteries, batteries do not need money, not the earth of pollution; the use of solar energy produced, to experience the bounty of nature, both environmentally-friendly and live music.